Moderate Party leader Ulf Kristersson, Green Party spokesperson Gustav Fridolin, Christian Democrats party leader Ebba Busch Thor and Sweden's Prime Minister and Social Democrat party leader Stefan Lofven during a TV debate in Stockholm, Sweden, Sept. 03, 2018. One in 3 news articles shared online about the upcoming Swedish election come from websites publishing deliberately misleading information, most with a right-wing focus on immigration and Islam, Oxford University researchers say. Their study, published Thursday, points to widespread online disinformation in the final stages of a tightly contested campaign that could mark a lurch to the right in one of Europe’s most prominent liberal democracies. The authors, from the Oxford Internet Institute, labeled certain websites “junk news,” based on several detailed criteria. Reuters found the three most popular sites they identified have employed former members of the Sweden Democrats party; one has a former MP listed among its staff. 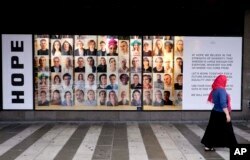 A woman walks by an ad promoting diversity and tolerance, at a shopping mall in Stockholm, Sweden, Aug. 31, 2018. Prime Minister Stefan Lofven, whose center-left Social Democrats have dominated politics since 1914 but are now unlikely to secure a ruling majority, told Reuters the spread of false or distorted information online risked shaking “the foundations of democracy” if left unchecked. Facebook, where interactions between users are harder to track, said it was working with Swedish officials to help voters spot disinformation. It has also partnered with Viralgranskaren, an arm of Sweden’s Metro newspaper, to identify, demote and counterbalance “false news” on its site. The top three “junk news” sources identified by the study, right-wing websites Samhallsnytt, Nyheter Idag and Fria Tider, accounted for more than 85 percent of the “junk news” content. A tournament organizer told the Dagens Nyheter newspaper that caterers had not served pork for more than 10 years for practical reasons, and there was no ban against eating or selling pork at the event. A report by the Swedish Defense Research Institute last week said the number of automated Twitter accounts discussing the upcoming election almost doubled in July from the previous month. Such so-called “bot” accounts shared articles from Samhallsnytt and Fria Tider more frequently than real people, the report said, and were 40 percent more likely to express support for the Sweden Democrats. The company declined to give specific figures about the amount or sources of false news it had recorded around the Swedish election, but said any flagged content is given a lower position on its site, a practice known as “downranking,” which it says cuts views by 80 percent. Users who see disputed articles are also shown other sources of verified information, it said.